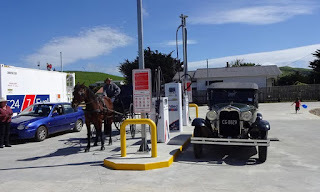 Residents of remote rural Pongoroa build their own service station so they don’t have to drive two hours to fill up. A tiny New Zealand town has built its own petrol station after local people got fed up with driving a two-hour round trip to stock up on fuel. Pongoroa in the lower North Island is home to just 120 people and has been without a petrol pump for four years. As a result residents faced a journey to other towns to fill up, often carrying extra jerry cans in the back seat to make it worth the expense. Frustrated with the commute and determined to keep their rural town viable, Pongoroa’s residents fundraised NZ$250,000 to build a petrol station. Petrol company Allied Petroleum contributed close to NZ$1m to the project, despite being initially sceptical the isolated fuel stop would ever pay off. Around New Zealand essential services are increasingly withdrawing from small towns and postal deliveries are being scaled back. “We are a rural community and farming is the main economic activity here. We are just trying to grow and future-proof our town,” said Andrew Casey, a local resident. To keep costs low, local people helped build the petrol station, holding working bees to prepare the site, supplying equipment and contributing to basic jobs. The pumps opened over the weekend and some locals say the home-grown effort has taken on a “spiritual” quality. Patrons at the Pongoroa Hotel couldn’t stop glancing proudly at the product of their sweat and toil. Allied Petroleum general manager Alastair Tennent told RNZ he suspected Pongora’s determination in getting a fuel pump would inspire other New Zealand towns in isolated regions to do the same.